The New Evangelization has become a buzzword of the age. Used by Pope St John Paul II it refers to the need to reach the faithless in the West whose parents and grandparents were Christian. But how do we reach these people who have no faith, but think they already know enough about Christianity to be hostile to it.? In a short and clear paper written in 2000 Benedict XVI outlined what he believes is the answer to this question. If people are to convert they must believe that the Church has the answer to the fundamental question: 'Which is the path to happiness?' We do not tell people the answer to this question, he says, so much as show them. By the example of our own happy lives and loving interactions we show Christ to others. And the only way we can do this is to strive to be walking icons of Christ supernaturally transformed so that we participate in the 'light' of the Transfiguration. There were two aspects of the Christian message that Pope Benedict felt would resonate today particularly when communicated in this way. First is that we demonstrate Christian joy that transcends human suffering so that in our own small way (or sometimes not so small) we bear suffering joyfully and with dignity as the martyrs did. Second is that we should communicate the fact of life after death and a just and merciful judgment by Christ. When we have joyful hope for a future that reaches beyond death, fear is dispelled and we are given a purpose in this present life (anticipating themes discussed later in Spe Salvi in much greater depth). Again this is more powerfully transmitted in the way we are than by us telling people directly that we are joyful and free of fear. How can we possibly live up to this ideal? The answer is that left to our own devices we can't, but with God's grace we can. The foundation of such a transformation says Benedict, is prayer. Benedict describes prayer life that is a balance of three different sorts of prayer all ordered to the Eucharist. These are, first, the Sacred Liturgy - the Mass and the Liturgy of the Hours; second, 'para-liturgical' prayers which are devotional prayers said in common such as the rosary; and third personal prayer which is said alone and in private. Most of us do not know how to pray well without being taught. Even the apostles asked Christ to teach them how to pray and Benedict tells us that we need 'schools of prayer' where we may learn to pray this transforming prayer. So, he seems to be saying, if we did not learn to pray in our own home (perhaps because you are a convert like me), we have a responsibility to learn and then to pray at home so that we each create our own domestic churches. Outside the family, a spiritual director is the best way to learn. These are hard to come by and so the next best thing is to look at books on prayer, Thomas Dubay's for example are good and of course one of the four sections of the Catechism is devoted to it. The book, the Little Oratory, A Beginner's Guide to Praying in the Home was written by myself and Leila Lawler with this aim in mind. (The word 'oratory', incidentally, derived from the Latin orare - to pray - means literally 'house of prayer'.) In this we pass on the guidance we were given when we asked of others that question, 'teach us how to pray'. It describes how to order prayer in accordance with the hierarchy that Benedict describes so that it lightens the load of daily living rather becoming a burden. 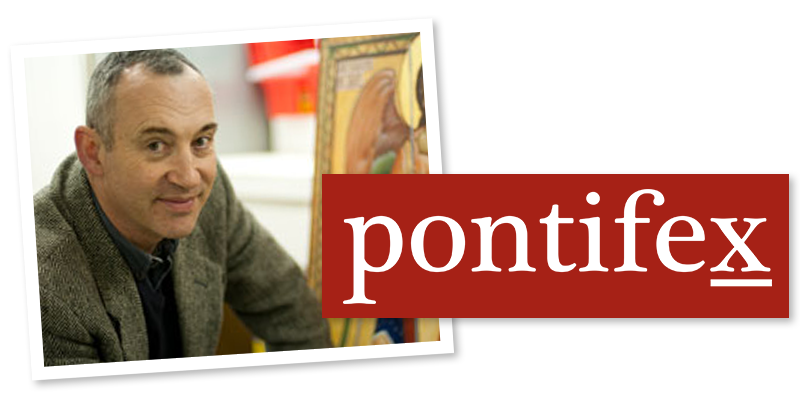 It addresses directly how to arrange the images for the icon corner in the home and how to pray to visual imagery. 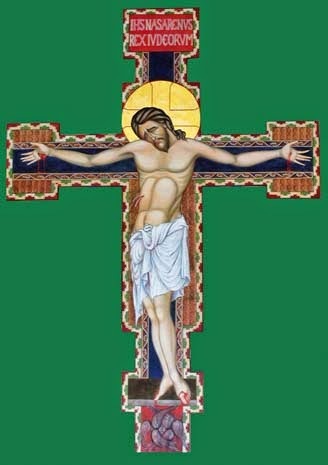 The traditional layout for the core imagery of the icon corner is as follows: in the center should be the suffering Christ, that is Christ on the cross; to the left should be an image of Our Lady; and to the right should be an image of the glorified Christ (perhaps a Veronica cloth or Christ Enthroned with angels). It seems that nearly every aspect of the Faith is contained in some way in just these images and there simply isn't room to talk about it all here. 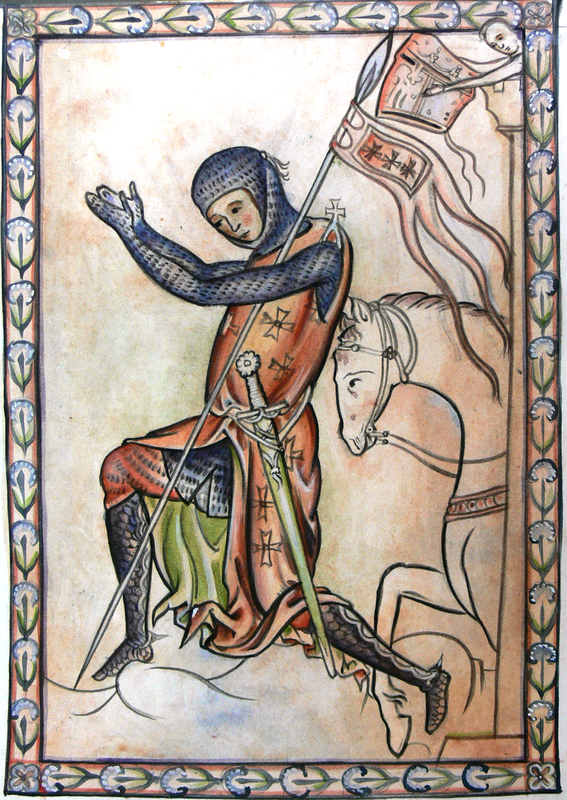 However, it is interesting to note that they speak directly to the concerns that Benedict brought out in regard to the new evangelization: Christ on the cross is the most poignant symbol of consolation in our suffering; and all images of Christ glorified communicate to us the glory of heaven and what is in store for us through deification. This is the transformation by which we participate in the divine nature through Christ. It happens by degrees in this life through participation in the sacramental life. Iconographic images of the face of Christ are always painted with an expression of compassion tinged with a slight sternness. This enigmatic combination tells us that Christ is a judge (hence the sternness), but that he is a good and merciful judge. Finally, the role of Mary is crucial in the new evangelization, I believe. All that the Mother of God does is directing us to her son. We see this portrayed directly in many images of Our Lady - she engages us with her eyes while gesturing towards her son. How will the domestic church evangelize the un-churched? At first sight it is not clear - it is possible that the images of the domestic church might communicate these truths to the faithless directly, who are invited into our homes, for example, but it is unlikely. That is not the point. The idea is that they are placed in the homes of the faithful for the effect it has on us. The beauty of sacred art communicates something that words alone cannot. When we pray with holy images, especially liturgical prayer as in the Divine Office, what we see impresses itself on our souls and we are raised up to the ideals they portray . Despite ourselves in many cases, we are transformed, partaking in the divine nature so that we may show Christ to others. As we leave our homes and go about our daily business, engaging with our fellows in a secular society, people see in us something greater, the divine person. It is Christ who affects those people, through us. It is a lay 'in persona Christi'. In so doing we emulate also, in our own diminished way, the life of Our Lady showed her son to us and prays for us to Him constantly. I painted the images below as examples that would be appropriate for an icon corner in a Domestic Church. In addition to the three core images - the face of the glorified Christ, Christ on the cross and Our Lady of Merrimack. The first is in a traditional iconographic style and the other two are in a Western gothic style. 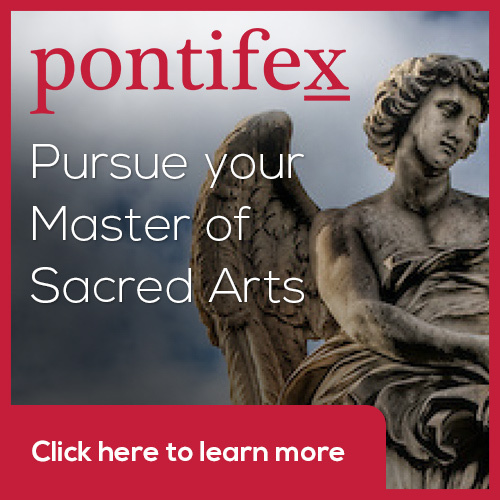 Don't forget the Way of Beauty online courses www.Pontifex.University (go to the Catalog) for college credit, for continuing ed. units, or for audit. A formation through an encounter with a cultural heritage - for artists, architects, priests and seminarians, and all interested in contributing to the 'new epiphany of beauty'.